Having performed over 15,000 root canals, Dr. Young Bui is one of Manhattan’s premier endodontists – a specialist in the art of root canal therapy. After receiving his Bachelor’s degree in Biology from California Polytechnic University at Pomona, Dr. Bui came to New York for dental school. He attended Columbia University School of Dental and Oral Surgery from 1994-1998, where he received his doctoral degree. After graduation, Dr. Bui did a year of residency at Our Lady of Mercy Medical Center in the Bronx. He then returned to Columbia University for his training in endodontics from 1999-2001. 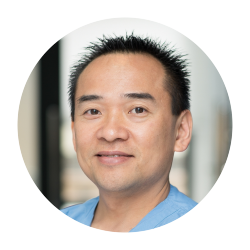 Dr. Bui is currently a member of the American Dental Association, New York County Dental Society, and New York State Dental Association. His philosophy of root canal is “mind over matter.” Get the fear out of your patient’s mind and nothing else will matter. Having a good sense of humor is important in reducing the patient’s fear of the dentist. Help your patient laugh the fear away.